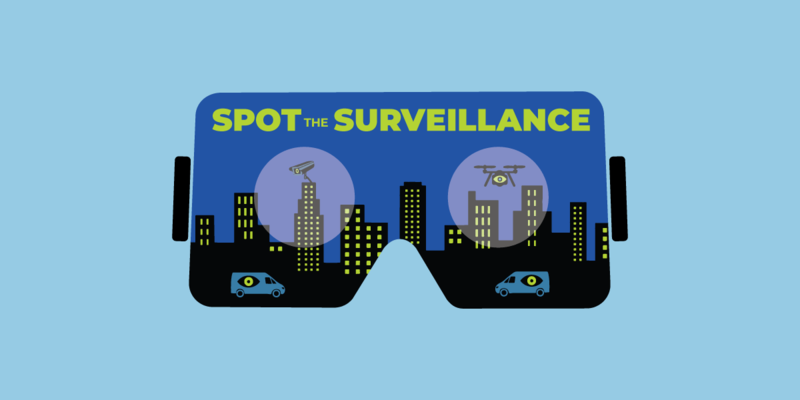 San Francisco—The Electronic Frontier Foundation (EFF) launched a virtual reality (VR) experience on its website today that teaches people how to spot and understand the surveillance technologies police are increasingly using to spy on communities. “We are living in an age of surveillance, where hard-to-spot cameras capture our faces and our license plates, drones in the sky videotape our streets, and police carry mobile biometric devices to scan people’s fingerprints,” said EFF Senior Investigative Researcher Dave Maass. “We made our ‘Spot the Surveillance’ VR tool to help people recognize these spying technologies around them and understand what their capabilities are." Spot the Surveillance, which works best with a VR headset but will also work on standard browsers, places users in a 360-degree street scene in San Francisco. In the scene, a young resident is in an encounter with police. Users are challenged to identify surveillance tools by looking around the scene. The experience takes approximately 10 minutes to complete. The surveillance technologies featured in the scene include a body-worn camera, automated license plate readers, a drone, a mobile biometric device, and pan-tilt-zoom cameras. The project draws from years of research gathered by EFF in its Street-Level Surveillance project, which shines a light on how police use, and abuse, technology to spy on communities. Created by EFF’s engineering and design team, the Stop the Surveillance VR experience can be found at https://eff.org/spot-vr. The current version is now being made publicly available for user testing, as part of the Aaron Swartz Day and International Hackathon festivities. EFF will be conducting live demonstrations of the project at the event on Nov. 10-11 at the Internet Archive in San Francisco. Swartz, the brilliant activist and Internet pioneer, was facing a myriad of federal charges for downloading scientific journals when he took his own life in 2013. EFF seeks user feedback and bug reports, which will be incorporated into an updated version scheduled for release in Spring 2019. The VR project was supported during its development through the XRstudio residency program at Mozilla. The project was also made possible with the support of a 2018 Journalism 360 Challenge grant. Journalism 360 is a global network of storytellers accelerating the understanding and production of immersive journalism. Its founding partners are the John S. and James L. Knight Foundation, Google News Initiative, and the Online News Association.